This is little Yuan Zai being reunited with her mom, Yuan Yuan at the zoo in Taiwan. I googled the translation of these words and learned that “Yuan” is the Chinese unit of currency and means “round coin,” so the mother’s name is, I think, “Round Coin Round Coin.” Fox News says Yuan Zai means “Child of Yuan Yuan.” Though, “zai” means “again,” so, really, the baby’s name is “Round Coin Again.” Maybe something is lost in the translation. Can anyone who speaks Chinese confirm this or school me? Anyway, the name will be changed, as the zoo has launched a naming campaign. 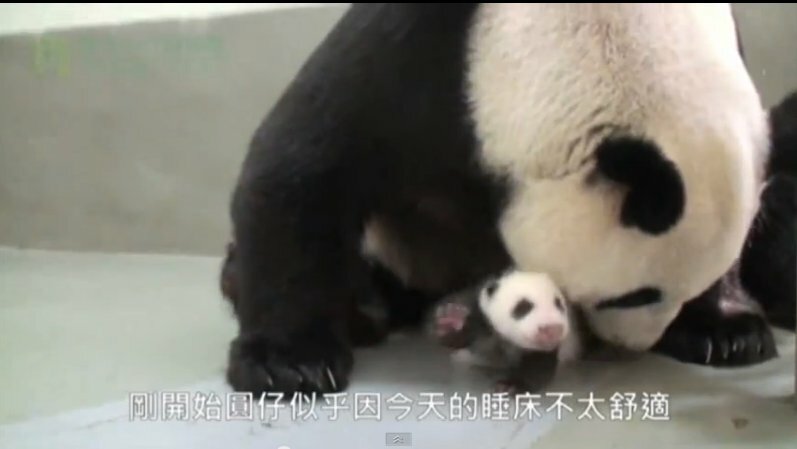 “Zookeepers in Taipei had to separate tiny Yuan Zai from its mother, Yuan Yuan, last month, to be raised in an incubator as the cub needed care and round-the-clock monitoring after it was slightly injured while being bred a few days after birth.” What? Being bred a few days after birth? Oh, Fox News, did something else get lost in the translation here? This is about a month later and it should make your heart grow a little. There are probably at least a dozen meanings for the word yuan and half a dozen for the word zai. It is impossible to accurately translate without the characters or at the very least the pinyin tone marks.